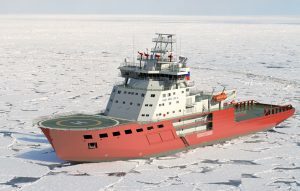 When electric motors are used in ice-breakers in arctic waters, they have to work reliably in temperatures of minus 60 degrees. To be up to the job, Hoyer's marine motor was modified with specially made parts and then thoroughly tested in icy surroundings. You need special equipment when icebreakers such as the Aker Arc 130 Icebreaking Support Vessel have to pave their way through two-metre-thick polar ice north of Siberia. Global warming has made sailing routes around Russia more negotiable, but ships are still subjected to extreme temperatures in the icy arctic waters. That’s why a special solution was needed when Spanish Fluidmecanica ordered marine motors for the anchor winch on the hardy icebreakers. Hoyer had to supply a total of 8 motors between 15 kW and 37 kW. The Russian Vyborg Shipyard required the motors to operate in air temperatures of down to minus 60 degrees celsius. That’s why changes were made to several vital components, so that the motors could withstand the extreme temperatures. “We adapted our marine motors with special bearings, gaskets and oil seal rings made of teflon. They were also fitted with metal cooling fans. The cooling fans are usually made of plastic, but in minus 30 degree temperatures, the material might snap,” says Adam Slupinski, Country Manager for Hoyer. Before the motors could be delivered, they had to pass a chill test to prove they could handle the cold. The documentation for the test was one of the conditions for the motors to be classified as per requirements from the Russian Maritime Register of Shipping (RMRS). Hoyer worked with test institute DELTA to conduct the tests. “The usual problem in cold surroundings is that damp in the bearings or frozen oil can lock movable parts. 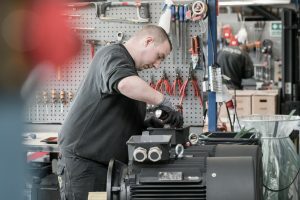 This is typically the case when the motor needs to re-start after having been switched off in extreme temperatures. That’s why we put the motor in a climate chamber, where we left it switched off for 24 hours in minus 60 degrees, and then went back to switch it on again. It worked flawlessly,” says Account Manager Erik Jensen from DELTA. After the approved test and classification, the motors were delivered to Fluidmecanica, and from then on to Vyborg Shipyard as part of the anchor winch. Despite the need for special modifications and the special chill test, the order was delivered in record time. “Next time we get a similar project, we will be able to deliver even faster as we now have the experience, the test documentation and internal procedures in place.